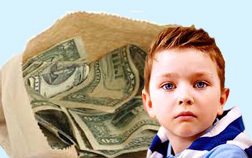 Most states have child support guidelines. These are formulas that the courts of a particular state will use to determine a child support amount. While the elements of the formula will vary by state, the most important factors are the incomes of the parties and number of children. The formulas will usually also include some type of adjustment for health insurance, child care costs and sometimes other expenses. Judges are usually empowered with discretion to vary from these formulas. Depending upon the particular judge and jurisdiction, this may or may not happen. If you think that your particular situation merits a variance from the formula amount, you should thoroughly discuss the matter with your attorney and decide whether it is worthwhile to present your arguments to the Court. While the Court may not grant your entire request, the Judge may make some type of favorable adjustment to the amount indicated by the formula. Common arguments to vary child support from state child support guidelines include tax issues, unreported income, large and unusual business expenses, prior child support orders, large and unusual personal expenses of a parent, children’s educational expenses, time spent at college, health and medical issues, other ways in which the non-custodial parent is supporting the child(ren), the amount of time the child(ren) are in the care of a particular parent, unusual travel expenses for visitation with the children, imputation of income; and the interplay of alimony and child support. Judges also usually have the discretion to determine who can claim any income tax exemptions and/or tax credits associated with the children (or at least adjust the child support amount to compensate for these exemptions and/or tax credits). An experienced divorce attorney will be able to evaluate your particular situation, tell you the particular tendenices of an individual judge and determine what types of arguments might be favorably received by the Court.